The Royal Conservatory of Music is pleased to announce a collective gift of $20 million from three couples: Michael and Sonja Koerner; Tim and Frances Price; and James and Louise Temerty. It is the largest gift in the 130-year history of the organization. The contribution is the lead gift to Resounding! The Campaign for The Royal Conservatory. 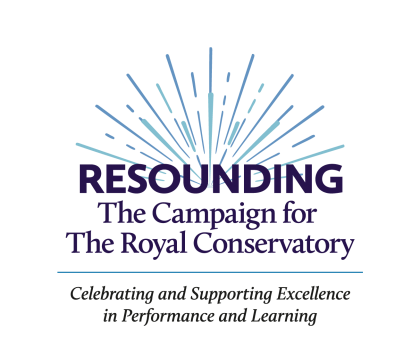 This comprehensive fundraising initiative, which was launched at the Conservatory’s annual Season Gala, celebrates and supports excellence in performance and learning at the RCM. The Resounding! campaign celebrates important milestones taking place over the next two years: the 20th anniversary of The Glenn Gould School, the Conservatory’s internationally acclaimed centre for professional training in music performance at the undergraduate and graduate levels, and the 10th season of Koerner Hall, a cultural hub in Canada that has earned a reputation as one of the world’s foremost concert halls. The Royal Conservatory of Music is one of the largest and most respected music and arts education institutions in the world. Providing the definitive standard of excellence in music education through its curriculum, assessment, performances, and teacher education programs, The Conservatory has had a substantial impact on the lives of millions of people globally. In addition, the organization has helped to train a number of internationally celebrated artists including Glenn Gould, Oscar Peterson, David Foster, Sarah McLachlan, Angela Hewitt, and Diana Krall. Motivated by its powerful mission to develop human potential through leadership in music and arts education, The Royal Conservatory has emerged over the last two decades as a leader in the development of arts-based programs that address a wide range of social issues. For more information, please visit rcmusic.com.